Last night I attended A Night of Fashion at the Art Gallery with my uni friend, Carney. 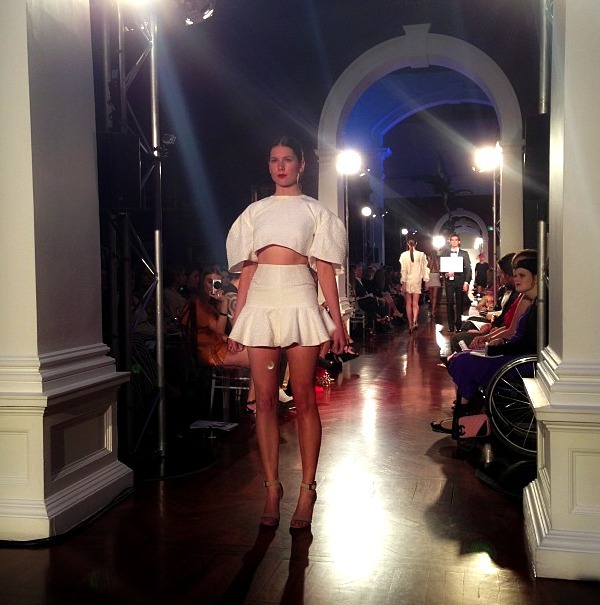 A Night of Fashion is presented by Adelaide magazine, Attitude, and showcases the latest collections from upcoming Adelaide designers as well as premium Australian designers. 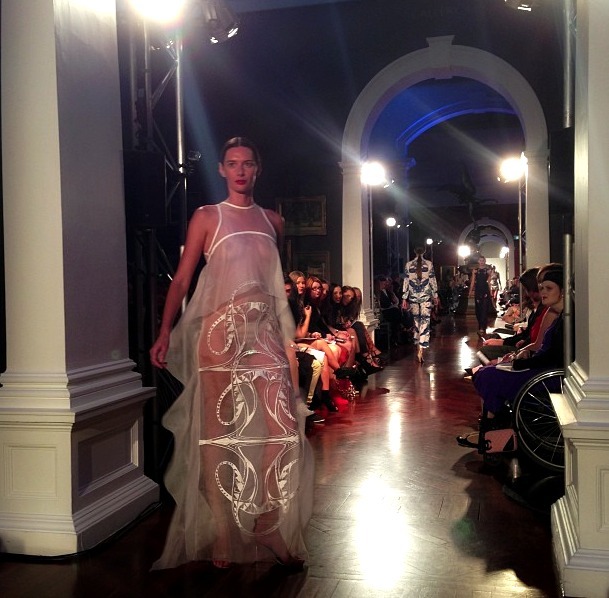 The event took place at Adelaide's Art Gallery, a fitting setting for a night of fashion, art and culture. After sipping on some of the most delicious cocktails ever whipped up by the staff from Zhivagos (one of my favourite clubs located on Currie Street - suss it if you're after beautiful men and Noughties beats), taking as many photos as possible and swooning over all the amazing looking people and clothes surrounding us, we headed into the historic Elder Wing and awaited the beginning of the fashion show. The runway was huge, delving through what seemed like countless galleries and illuminated by bright blue alien or underwater-like lights - one would almost think upon being seated that you had entered another world! After being welcomed by the gorgeous and beautifully spoken Nerida Foord, the music started pumping and the show began. Toni Maticevski's collection strutted down the runway first, a vision of white, crisp dresses that are a mix of structured and floaty - the epitome of powerful yet lady-like women. Maticevski kept mainly to a monochrome scheme but some blush pink did pop out. I loved the clean lines and subtle sequin and metallic detailing of his designs - this collection does actually remind me a bit of Alexander Wang's Spring 2013 work. Next was Carla Zampatti, who I always admire for her perfect combination of classic and risky. Her collection included white dresses that looked like they could belong to Greek Goddesses, with flowing hems and halter necks, jaquard prints, structured jackets and classic, tailored cuts. Bianca Spender (who I'm sure did her mother, Carla Zampatti, proud) was the first hit of colour on the runway, showcasing a variety of greens ranging from forest shades to silvers and blues. Structured tops were a common theme in her collection, with padded shoulders, origami-style strapless dresses and tailored jackets. Then came Scanlon & Theodore, presenting cutting edge yet completley wearable designs. Feminine, frilled ballerina hems in crisp whites as well as daring marble and mod prints were the collection's main aspects. It was more laidback than the collections showcased beforehand, with the sports luxe theme of last season still slightly shining through - think leather and cute shorts, as well as short sleeve spring knits. 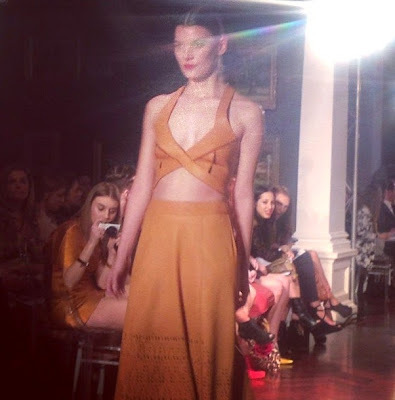 Willow's collection was definitley one of my favourites, I think I gasped a little too loudly at the model strutting by in a co-ord tan leather bralette and matching skirt... but come on, it was AMAZING! All of the models had thick choker necklaces in black or white, which I loved, and lace up Hercules-style heels that oozed sophistication. The collection stuck to a monochrome colour scheme with hints of tan and grey and the clothes had the perfect amount of exposed skin - v-necks, backless dresses, mesh and perforated leather. 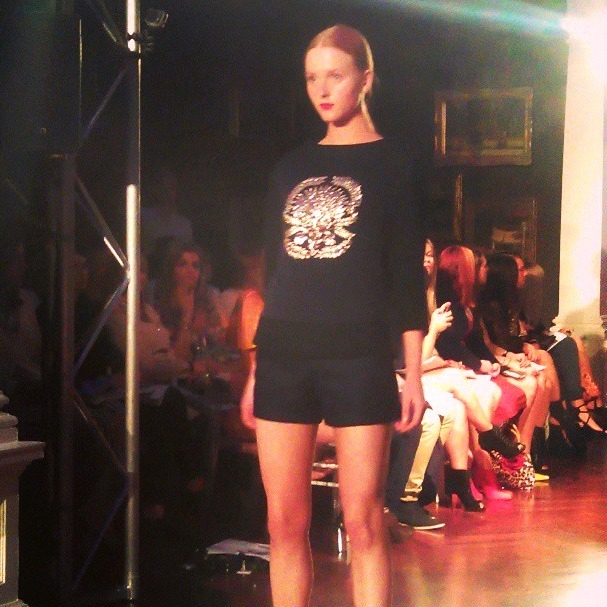 Collette Dinnigan's collection was the most wearable of the show, channeling grungy street-style vibes. She perfected 'sophisticated bad girl', with Kenzo-inspired embellished jumpers, leather dresses, lace and sequin detailing paired with bright red lips and slicked back pony tails. And colour? What colour? Black on black on black on black. Alice McCall is one of my favourite Australian designers and her collection did not fail to please. I absolutley adored her perfect balance of feminine/floaty and structured. As usual, her prints were amazing but were mainly kept to co-ords (and if you look at my A Perfect Match post, you'll see how much love I have for co-ords). Her dresses were beautifully feminine but with a modern twist, which is why I love her designs so much - they are always so obviously her but never boring. And just to gush even more like the McCall stalker I am - I love love LOVED her use of white (which was a surprising element) and that. sheer. dress. SIGH. Favourite of the night, for sure. 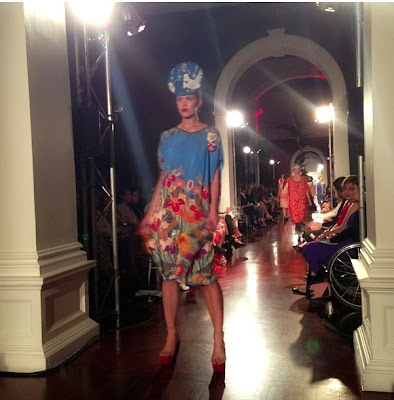 I have to admit, I had never heard of milliner Suzy O'Rourke before last night - but what an introduction! A designer of hats, fascinators and pretty much art you can wear on your head, her collection was striking. It kept to a geometric theme that reminded me of the 60's mod era. Like most collections of the evening, O'Rourke stuck mainly to a monochrome scheme but bursts of bright pink kept the Barbie side of me super happy. I especially loved the headpieces shaped as tiaras - cute! Last, but definitley not least, Akira took the runway. The main reason I love Akira's designed is because he is such a multicultural being (he was born in Japan and moved to Australia in the 80's) and this always comes through so beautifully in his designs. Akira's collection had the usual Japanese element with beautiful bamboo/floral prints and kimonos but also took on a tribal vibe, with head pieces and kaftans. It was an explosion of colour which I loved - what gets you more excited for summer than bright colours? Probably my second favourite of the night. At the end of the show, we enjoyed some drinks and delicious sweets supplied by Cibo in the Art Gallery Gardens whilst people watching - we're 90% sure we spotted Paolo Sebastian actually! Star struck! The winner of the Blank Canvas was also announced - Belinda Zanello. The Blank Canvas is an opportunity for emerging artists and designers to showcase their designs and is a new addition to the Night of Fashion event. The winning design, Belinda Zanello's gorgeous, cream couture gown, receives a $500 cash prize, a $300 Premiere Arts Supplies voucher and editorial coverage in the September edition of Attitude magazine - all in all, a fantastic boost in the fashion world. Personally, I liked the design by Anna Cavuoto best - sleek, structured and elegant - but Belinda's design was definitley the most extravagant. To A Night of fashion at the Art Gallery, I wore a dress from Sooki Boutique, shoes by Bellini, transparent clutch from Somethin' Somethin', watch from Sportsgirl and multiple tiny necklaces that are impossible to see in photos from Lovisa and Collette. Most of the photos included I took myself on my humble iPhone.The ones I didn't take myself I have sourced. If one of them is yours, or somebody you know's, and I haven't sourced it correctly, let me know! I'll fix it ASAP!